Oahu Scuba Diving Guide - Oahu has long been one of the most favorite scuba diving spots with divers from across the world. The warm tropical waters of the Pacific Ocean are home to a diverse range of aquatic life like Hawaiian green sea turtles, dolphins, sea lions, humpback whales, and hammerhead sharks. The sea bed's unique topography is another major attraction. 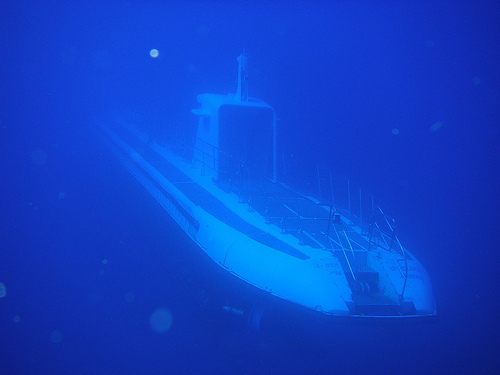 These, together with the fact that Oahu is the site of several famous ship wrecks including the Corsair plane wreck, make the place a scuba diver's paradise. If you are new at this and want to try out scuba diving, Oahu offers a lot of opportunities for beginners. There are several diving centers in Oahu that have pools where training sessions are held for amateurs. You can try out scuba diving in the shallow, crystal clear, and calm waters of the pool under the guidance of experienced divers. Not only will you be taught the basic skills, you can also learn about the different uses of scuba equipment. And the best part, anybody over the age of 12 can take scuba diving lessons in Oahu. All you need to do is be in good health, and your instructors will take care of the rest. 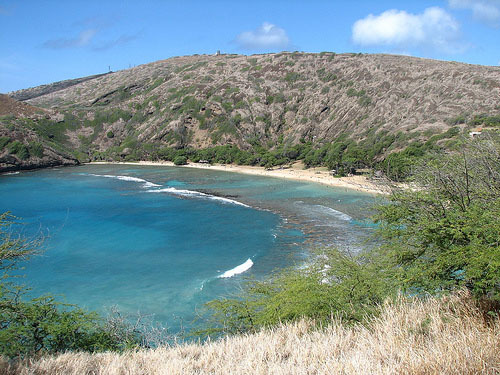 Horseshoe Reef is a great place for scuba diving in Oahu. With depths of around 50 feet, this place offers some of the best underwater photography opportunities. You can see a variety of snake eels, cleaner shrimps, crabs, zebra morays, octopuses, and frog fishes. Turtle Canyon is another such place where you can come across octopuses, eels, and white tip reef sharks. With depths between 25 and 40 feet, Turtle Canyon and Horseshoe Reef are the best scuba diving areas for beginners. The underwater reef system of Fantasy Reef offers depths from 40 to 60 feet and is a wonderful spot for both day-time and night diving. It is also home to a large number of Hawaiian green sea turtles. And if you're lucky, you can spot a few sharks as well. Another place known for its abundant marine life is the Koko Craters. At a depth of about 40 feet, you can swim with Hawaiian green sea turtles, eels, and Hawaiian cleaner wrasses. Divers interested in drift diving or wall diving should pay a visit to China Walls. This area includes a number of popular diving spots like the Spitting Caves, Big Sea Cave, and Baboon's Nose, and is particularly known for its breathtaking beauty. However, you need to be extremely careful while scuba diving in this region since the waters can be quite treacherous. 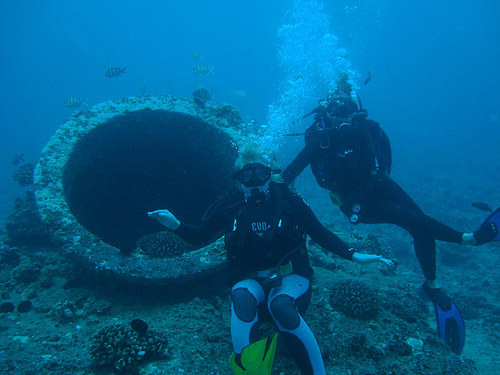 The Kewalo Pipe, which was originally used as a storm drain, is now famous for its corals. The stunning beauty of the sea bed and the sheer variety of corals in this part of the ocean make it a popular destination for scuba divers. Apart from the corals, you can also see sea creatures like crabs, eels, and cleaner shrimp nestled around the coral-covered drain pipe. If you happen to be among those intrigued by wreckages, scuba diving in Oahu will prove to be a thrilling experience for you. To begin with, the famous wreck site of the World War II Corsair fighter plane that crashed in 1946, is very close to Oahu. At a depth of approximately 105 feet, the Corsair stands upright and all in one piece. Large eels as well as garden eels can be seen all around the wreck. The Sea Tiger Shipwreck is another popular haunt of adventure lovers. 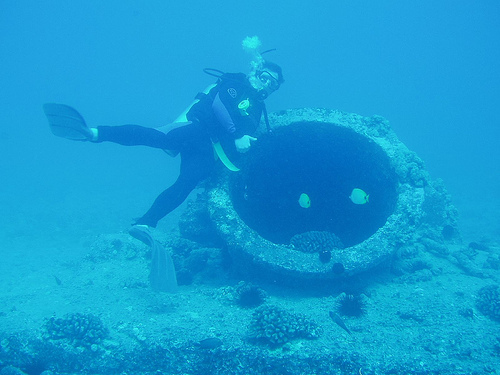 The ship is about 165 feet in length and 40 feet in width, and is one of the largest shipwrecks in Oahu. In addition to exploring the wreck site, you can also spot eagle rays, sting rays, and the elusive frog fish. One of the other great wreck sites in Oahu is the place where the YO257 ship was sunk in 1989. Built as a Navy refueling vessel during World War II, this ship stands at a depth between 65 and 110 feet. Scuba diving in this place is recommended for certified divers. Amber jacks, green sea turtles, large eels, sting rays, eagle rays, and white tip reef sharks are a common sight here. Share Your Oahu Scuba Diving or Hawaii Vacation: We're looking for stories, tips and experiences from any Oahu vacation you've been on. Why not take a few moments and Share it with everyone! We Hope You Find This Oahu Scuba Diving Information Guide Helpful, Have A Fun & Romantic Getaway in Oahu Hawaii!! !